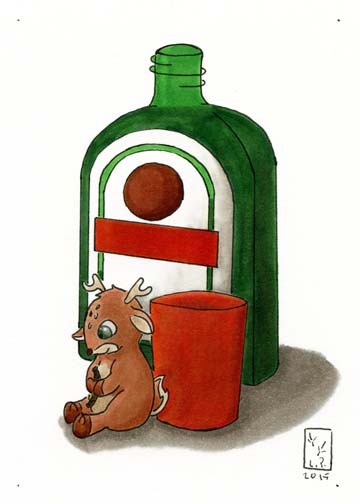 Jaegermeister sports a deer on it’s bottles so this bottle clearly can’t be Jaegermeister 😉 but that little deer just couldn’t resist a cup. This was made with copic marker, liner, and paint pen. Sometimes you see me type paint pen and sometimes copic paint. The difference is sometimes, if the marker isn’t dry, the color will leek through the paint pen but you can remove it with a wet finger. Copic paint has to go on with a paint brush and doesn’t come off without removing marker but the marker doesn’t seep through.